What is your next adventure? I had a great dilemma: I was offered an internship at JPL, but I had to turn it down because I wanted to be prepared to begin my doctoral program at MIT. Right after graduation, I'm going to travel a little in Italy, Germany, and Switzerland, then I'll move to Cambridge where I will be a Space Systems Fellow. I'll spend half my time at MIT, and half at the Draper Lab, where I will work in the Complex Systems Science Group solving problems in a number of areas. What are you most looking forward to in your next adventure? I cannot wait to be in Boston. I think it's a very exciting place. And my fellowship pays for full tuition and a monthly stipend, so I will really be able to concentrate on my research. I'm interested in studying space systems - problem solving and optimization of trajectories, top level mission architecture, the cost-effectiveness of different vehicles and technologies. Mainly, I'll be studying controls and autonomous systems. Do you have any previous co-op, internship, or research experience in this area? I co-opped at NASA Kennedy in the electrical process group for the ISS [international space station] for one semester. Then I co-opped two semesters in the flight dynamics group of launch services. I fell in love with trajectory stuff. I also did research with Dr. Saleh, which ended up producing a paper that I presented at a professional conference in Jerusalem. What about your educational experience at GT-AE helped you to achieve your goals? It's cliche to say, but the quality of the educational experience was what helped me the most. From the day I got here, I was so aware of how privileged I was to be at Georgia Tech, so I always fought to take advantage of it. I never skipped a class, and I always stayed after class to ask questions and listen. I couldn't believe I had access to such smart, accomplished people. A lot of times, when I got really tricky homework, I would think 'Oh, that's an interesting way to set up that problem.' 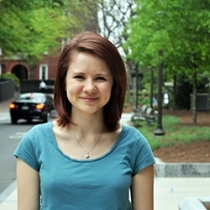 I would work very hard, but at the same time, I always thought 'This is why I came to Georgia Tech - to be challenged." What advice would you give someone who wanted to follow in your path?For me it's: take the first year very seriously. It will set you up for success. I didn't mess around. I studied like crazy at the expense of having a social life. I scheduled everything, including study breaks, and I factored in extra time for work that was harder. I chose to study alone, so there would not be any distractions. I didn't want to study with anyone until I'd spent sufficient time on the material first. And, finally, one of the biggest things for me was: I studied the material before I got to class, so when the lecture began, I'd understand it.